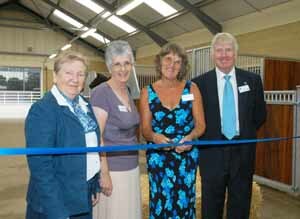 Animal welfare charity Blue Cross has built a home for sick and abandoned horses at Sunnymead Farm in Dovecliff Road. The site was left to the charity in the will of former owner Bob Archer. Further details can be found here. Initially the centre will cater for approximately 25 horses and ponies though this number will increase to approximately 35 horses as the centre becomes more established. With many horses in The Blue Cross’s care coping with some form of behavioural problem, Blue Cross equine staff need a balance of empathy and experience to ensure each and every horse is given the most appropriate training. The centre opened its doors to the public on 19 August 2006, and an official opening took place on 29 September. All they want for Christmas...is grass! 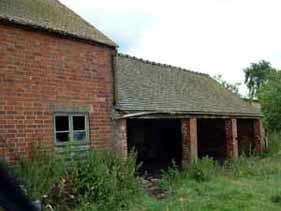 The existing farm buildings were old and dilapidated and are being replaced. 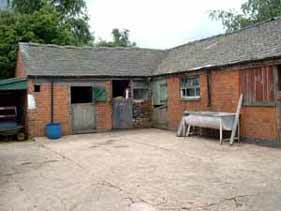 Leading equine charity, The Blue Cross, started work in June 2005 on a new equine welfare centre at Rolleston in Staffordshire. The Rolleston site, located just off the Dovecliff Road, was bequeathed to the charity in 1990 by Mr Robert Archer, to establish an animal sanctuary in memory of his late wife Hilda. Working to support the two existing Blue Cross equine centres in Oxfordshire and East Sussex, the new 60 acre site will have the facilities, space and equipment to allow Blue Cross staff to give up to 35 horses at any one time the help they deserve. Over the past decade, The Blue Cross has seen an increase in demand for its equine welfare services, so the central location of the new centre will help the charity extend its reach to even more needy horses. Established over 100 years ago to combat the problems faced by working horses, today The Blue Cross is better known for its work rehabilitating and re-homing horses and ponies in need. The charity’s equine centres are not retirement sanctuaries - the charity’s goal is for all its animals to be given a second chance in a worthwhile, fulfilling new home. The Blue Cross has been keen to ensure that the centre’s development is an asset to the site and local community. In empathy with the wishes of the late Mrs Archer, the new development leaves existing copses and hedgerows intact and is sympathetic to the environment. New tree planting in small spinneys will complement existing vegetation. The centre itself comprises three principal barns, providing individual stabling and veterinary care facilities, communal loose housing and hay, bedding and feed storage. 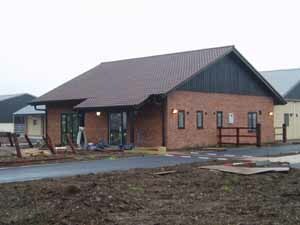 A brick built reception building accommodates admin support, including an information centre and educational materials, as well as visitor facilities. Recruitment for staff to run the centre commenced early in 2006, followed by development of a local volunteer network to assist with specific centre activities once it is fully operational. It is hoped that the centre will be able to recruit successfully from the immediate local area. The centre’s primary role is rehabilitation: bringing horses back to physical health and mental well-being, through dedicated care and re-training, to enable them to resume active lives in private homes on a monitored loan basis. The Blue Cross has eleven small animal adoption centres across the country, each forming an integral part of the community in which it is based. Some of these centres have been providing animal welfare services in the community for over ninety years. It takes time to become established in a new area and to develop local support and links, and The Blue Cross has been encouraged by the amount of interest in the new development in Rolleston. Kerstin Alford, director of equine welfare, at The Blue Cross said: “The new Rolleston centre will be a huge benefit, enabling The Blue Cross to provide a safe future, through its re-homing scheme, for even more horses and ponies that need help. 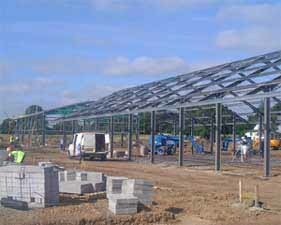 Read the Burton Mail article “Equine centre work gets underway” here. The new Blue Cross equine centre in Rolleston will soon be preparing for its first intake of horses and ponies. The new facilities have been custom-designed and built to a highly practical specification and the work has been overseen, every step of the way, by Kerstin Alford, equine welfare director for The Blue Cross. 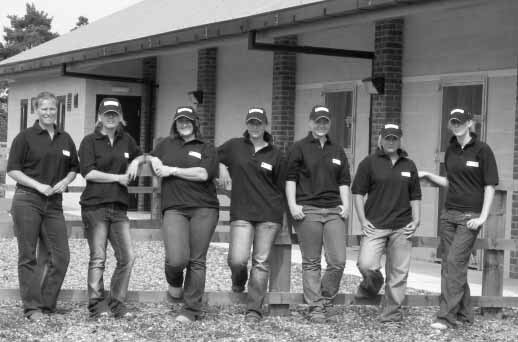 Kerstin explains: “The new yard, paddocks and training facilities at Rolleston are very workmanlike and practical. The accommodation is flexible with a combination of stabling and communal barns, as well as a series of field shelters with hard standing. An extensive fencing programme is now underway to ensure maximum safety and security for all Blue Cross horses taken into the centre for rehabilitation”. The site comprises ten stables housed in an internal barn style complex, combined with separate communal barn housing and corral facilities providing a range of flexible housing options. 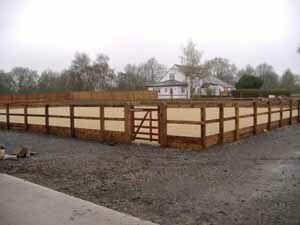 Outside there is a large manege and an additional schooling area with a specialist sand-based surface to ensure that safe and varied training programmes can be carried out. The Rolleston site was completed and handed over to The Blue Cross in early May and an expert team of staff has now been recruited with the majority recruited from the local area. They all bring with them a range of skills as well as knowledge of the area, which will be of huge benefit to the centre. Initially the centre will cater for approximately 25 horses and ponies at any one time, though this number will increase to approximately 35 horses as the centre becomes more established. It’s been an action-packed few months at the new Blue Cross equine centre in Rolleston. 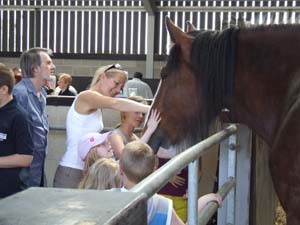 The centre has been operational since 19 August and staff estimate that over 1200 people visited the charity’s new facilities on a recent open day to find out more about the equine charity’s work with needy horses, watch riding displays and demonstrations and browse the numerous stalls and information stands. 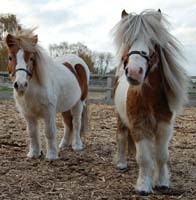 Misty and Star, two Shetland ponies who came to The Blue Cross when their owners could no longer afford to take care of them, were just two of the animals being cared for by the grooms at Rolleston. Both the ponies are on the charity’s new “sponsor a pony” scheme and sponsors are able to visit them at the new site. Several other horses and ponies have already been transferred to the site from the existing Blue Cross centres at Burford in Oxfordshire and Northiam in Sussex to increase opportunities for them to be re-homed to a wider surrounding area. Horses and ponies at the Blue Cross equine rehabilitation centre on Dovecliff Road, Rolleston-on-Dove, were joined by a host of guests on Friday 29 September to celebrate the grand opening of the new centre. Mrs Brenda Luke and Mrs Susan Brown, great nieces of Robert Archer who bequeathed the land to The Blue Cross in memory of his late wife Hilda, cut the ribbon to officially open the site and spoke about their family's love of animals and delight at seeing the centre helping so many needy horses and ponies. Guests were also present at a riding display where Blue Cross grooms demonstrated how a balance of empathy and training had helped the horses overcome past problems and given them a second chance of a worthwhile, fulfilling future. 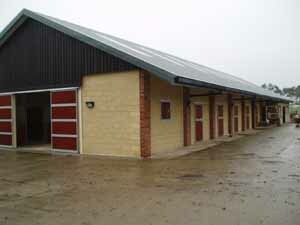 The Blue Cross Equine Welfare Centre at Rolleston has been open almost a year. In that time it has helped nearly 40 horses and ponies, some of which have suffered neglect and cruelty, others who have been handed over by their owners who are no longer able to keep them. It has received 30 horses directly into the centre from the local area and the North with others coming from welfare organisations such as Redwings and the RSPCA. Since it opened the centre has re-homed 17 horses and ponies, and has recently expanded its team with the addition of deputy centre manager, Charlotte Hughes and two grooms, Kathryn Swinnerton and Gary Stubbs. Volunteers play a vital role in the running of the centre and The Blue Cross has built up a strong volunteer base. The volunteers give their time free of charge to help out at the centre and help with a variety of jobs including, yard work, reception cover and maintenance. Without the assistance of the volunteers staff at the centre would not be able to dedicate so much of their time to working with the horses in their care. 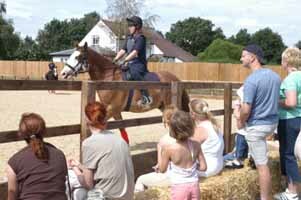 As well as the core work of rehabilitating and re-homing horses the centre also carries out other activities. As The Blue Cross is funded entirely on public donations, many fund raising activities are carried out ensuring it is able to carry on its good work. During December the Centre at Rolleston held a Christmas Open Day which included a demonstration with miniature Shetlands Misty and Star and of course a visit from Santa! The annual summer Open Day is on Saturday 28th July and it is hoped it will as successful as last year’s and will include a variety of demonstrations by the Blue Cross grooms and horses. The Blue Cross actively promotes responsible horse ownership to ensure best practice in the care and welfare of equines. The charity produces nearly 30 ‘Caring for horses’ leaflets covering all aspects of horse care from basic first aid and ailments to Yard Safety and Security. As part of the education programme the centre is running a series of Pony Care Days aimed at helping youngsters grasp a basic knowledge and understanding of what is involved in the daily care of ponies, in addition it has also run a ground schooling course designed to help participants understand the benefits of lunging and long reining. As well as its educational programme the centre is holding a number of unaffiliated dressage competitions throughout the summer and has been asked to participate in the Pony Club Championships in Nottinghamshire in August. As the most prestigious event in the Pony Club calendar, the Blue Cross is delighted to be taking part and will be taking a number of horses to provide a demonstration. The Blue Cross equine centre in Rolleston-on-Dove welcomed over a thousand supporters to its summer open day on Saturday (28 July), raising an impressive £2,000 for the charity. An unexpected spell of bright sunshine allowed visitors to make the most of the outdoor activities and riding displays. A highlight of the day was the re-enactment of The Blue Cross’s 110-year history, where staff and horses dressed up in war-time costume and even the centre’s resident dog Spud had a part to play. The open day was supported by many local businesses who donated some impressive prizes for the prize draw. Local volunteers were also invaluable, running stalls and attractions including face painting, a bouncy castle and an archery masterclass. Many people came along with young families and even brought animals of their own. Daniella Smith who came with her family from Stretton said: “There are lots of horses. I’ve been stroking them. And I’ve been on the bouncy castle!”. Wicka, an elderly horse in a pitiful condition, has been admitted to The Blue Cross equine welfare centre in Rolleston for specialist rehabilitation. The horse, estimated to be around 20 years old, was found in a very underweight condition and suffering from rain scald – a painful bacterial skin condition caused by prolonged exposure to severe wet weather, without shelter. Wicka was originally purchased by a well-meaning but inexperienced animal lover, who had seen the horse’s obvious state of neglect as he passed his paddock by the side of the road. The animal lover was unable to provide Wicka with the specialist attention he needed to make a full recovery so, with the support of the RSPCA, he signed Wicka over to The Blue Cross. 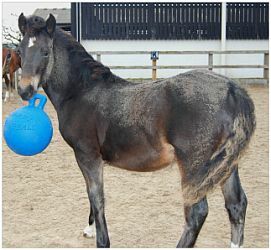 Wicka was immediately taken to the charity’s rehabilitation centre at Rolleston in Staffordshire, where he is now under the specialist care of the centre’s dedicated grooms. He has been examined thoroughly by the centre vet who has prescribed treatment for his rain scald and has devised a diet and exercise regime designed to allow Wicka to build weight and condition slowly and safely. The Blue Cross is funded solely by public donations and relies on the support of equine lovers. Facilities and resources are not infinite, which means that needy horses can only be admitted to the centres once rehabilitated horses have been re-homed. The Blue Cross equine centre on Dovecliff Road is having a busy year so far, caring for more than 45 horses and ponies at any one time. The centre takes in, rehabilitates and re-homes unwanted horses and ponies, and is constantly in demand to offer help to equines of a variety of shapes and sizes. Wicka, a severely neglected horse who featured in the Winter issue of Rollestonian, continues to make good progress. His condition is improving as he is gaining weight and he is very happy and sprightly! One of the latest arrivals at The Blue Cross is Bossie, an Ardennes mare, which is a rare breed originating from Continental Europe. They were bred for their ability to pull heavy loads through rough terrain so they have exceptionally thick chests and legs - making Bossie almost as wide as she is long! Unfortunately she has an ongoing eye condition that requires attention from experienced staff several times a day. Due to the level of care Bossie requires and her wonderful temperament, she will remain at the centre for the foreseeable future and has joined cheeky ponies Misty and Star on the Sponsor a Pony scheme. Animal lovers who want to support the work of The Blue Cross can pay an annual donation to receive a certificate, regular updates on their chosen pony, and the opportunity to visit if they wish. The recent wet weather has been bad news for field-kept horses and their poor grooms! Muddy conditions need careful management, but fortunately a large woodchip area installed in one of the paddocks last year has provided some respite away from the mud. It will also be useful in the summer for ponies requiring restricted grazing. The centre hopes to raise funds over the coming months to install more areas like this and stone gateways to make it safer for horses and people. The centre is also open to the public on Saturday, Sunday, Wednesday and Thursday from midday to 4pm. Visitors are welcome at other times by appointment. Please phone 0845 260 5505 or email - rolleston@bluecross.org.uk. The Blue Cross has been lucky enough to be chosen as Charity of the Year at Badminton Horse Trials 2008, the largest equestrian event in the eventing calendar. 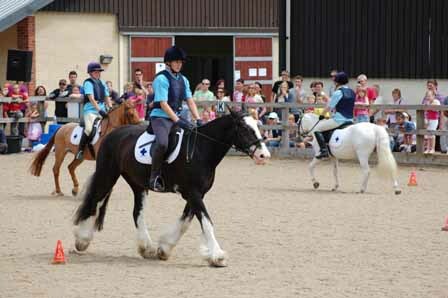 Blue Cross horses from Rolleston will join those from other centres to perform a riding display in the main arena! The charity will be carrying out fundraising activities at the event in May and is already looking for volunteers to help. For more information, please phone 01993 825 568 or email badminton@bluecross.org.uk. Staff and horses from The Blue Cross equine centre in Rolleston had the great honour of attending the Mitsubishi Motors Badminton Horse Trials as Charity of the Year at the beginning of May. The internationally renowned event, attended by thousands of spectators each year, was an amazing opportunity for The Blue Cross to raise awareness of its work and vital funds to support the animals in its care. Horses and grooms from the Rolleston centre had the great privilege of giving a riding display to music for Badminton spectators during the popular cross-country day at Badminton. Commentary was provided by six-time Badminton winner Lucinda Green, who described each of the horses who were looking for homes. Blue Cross Painter led the way, an 11-year-old, 14.3hh Sports Horse from Rolleston. She is a striking looking mare but when she came into The Blue Cross she was unruly and obese. Staff were confident that she could be a happy and active horse with the correct management, and she has now completed an extensive fitness and training programme. The Blue Cross is looking for a knowledgeable home for her as an all-rounder. Blue Cross Shadow followed from Rolleston, an 8-year-old, 15.1hh cob. He came into the centre due to behavioural problems that had caused his owner to lose confidence. Initially he was overweight and very unfit, so he was put through a programme of rehabilitation. In the right home he will make a super riding horse but The Blue Cross will need to take great care to match him to a rider who will not allow him to slip back into his old ways. Finally, Blue Cross Sonny entered the ring, a 19-year-old 15.2hh Connemara from Rolleston. He is a striking, affectionate horse who came to the charity due to his owner’s ill health. He is now looking for a new home where he can be used for hacking and some light dressage. He is a very friendly horse who likes attention but he needs a special home with experience of managing laminitis. Over the four days of Badminton Horse Trials, thousands of spectators visited The Blue Cross stand to show their support and find out more about the work of the charity. Over a hundred volunteers helped to collect donations from the public and sell raffle tickets to raise vital funds for the animals in the care of The Blue Cross. 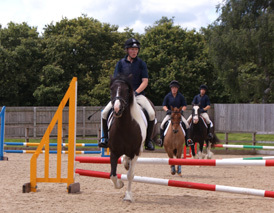 The open day at The Blue Cross equine centre in Rolleston-on-Dove on Saturday 26th July was a resounding success. Despite a forecast of torrential rain, the sun shone through and an impressive £3,000 was raised for the animal charity. Over 1,500 visitors made the trip to the centre at Rolleston to enjoy the equine attractions, which included a riding display by some of the horses that are ready to go to loving new homes. The crowds were also treated to a side-saddle riding demonstration, which proved particularly popular. As ever, the bouncy castle was a huge hit with the children and they also enjoyed face painting, games and competitions. The famous Coors Shire horses, currently residing with The Blue Cross temporarily due to the closure of the Coors visitors centre, were one of the main attractions alongside the Blue Cross horses and ponies who are currently looking for new homes. Families flocked to see the impressive animals and one lucky visitor won a prize for guessing the combined weight of the three horses - a hefty 2740kg! The Blue Cross has announced that it has appointed a new chief executive, Kim Hamilton. Ms Hamilton will take up the role on 1 September 2008, following the retirement of John Rutter after seven years in the driving seat. Kim Hamilton is currently chief operating officer at Nacro, an organisation that gives ex-offenders, disadvantaged people and deprived communities the help they need to build a better future. Previously she spent over 20 years at Citibank, working her way up the organisation to hold several senior positions including UK treasurer. It’s a busy time of year for The Blue Cross equine centre in Rolleston as demand for our services is as strong as ever. With increased costs of food, bedding and electricity bills during the winter and the credit crunch continuing to bite, many horse owners are coming to us for help because they are struggling to cope. We currently have 40 horses and ponies in our care with more arriving in the next few weeks. The Blue Cross does not receive any government funding so we rely on the support of the public to continue our vital work. Local animal lovers are invited to show their support at our Christmas Fun Day on Saturday 6th December, from 11am to 3pm. Come along to enjoy festive fun for all the family with mulled wine and minced pies, Christmas crafts, a raffle and tombola. 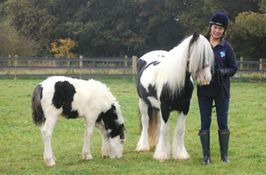 Meet the animals at the centre and find out more about our work rehabilitating and re-homing horses and ponies in need. 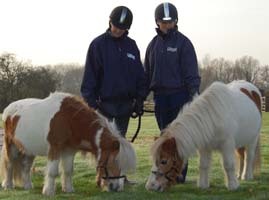 Misty and Star are two gorgeous miniature Shetland ponies that were signed over to The Blue Cross in May 2000 when their owners were no longer able to care for them. At first they seemed rather timid but after settling in they quickly turned into two very cheeky and adorable ponies, who get up to all sorts of mischief together. They can often be seen taking part in local events such as open days and parades. Because they are such good friends, Misty and Star are sponsored as a pair. Bossie is an Ardennes mare, a rare breed that is bred for their ability to pull heavy loads through rough, muddy terrain. As a result they have exceptionally thick chests and legs, making Bossie almost as wide as she is long! Unfortunately she has an ongoing eye condition that requires attention several times a day from the experienced staff at the Rolleston centre, but despite her condition Bossie has such a wonderful and loving temperament. Look out for our open days and events in 2009, including Pony Care days on Monday 16th February (8-10 year olds) and Tuesday 17th February (11-14 year olds). 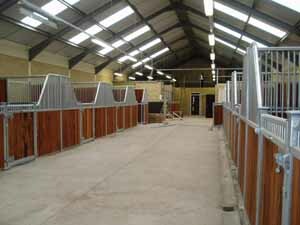 Last year (2008) was the busiest year on record for The Blue Cross equine centre at Rolleston. Demand for the centre’s expert rehabilitation and rehoming service was greater than ever, while the animal welfare charity’s various events and equine educational projects drew record numbers of attendees. 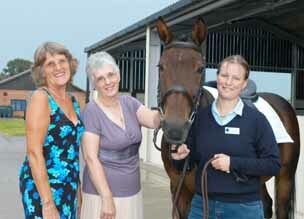 In 2008 The Blue Cross Rolleston centre found new homes for a total of 41 horses and ponies, an increase of 14 on 2007. This meant the charity could take in even more horses and ponies in need. A total of 119 local children enjoyed attending the centre’s educational pony care days and around 250 individuals participated in tours of the centre or talks about the charity’s equine welfare work. Rolleston centre manager Kath Urwin explains: “We opened in 2006 and are delighted so many local people are becoming more aware of the work we do, particularly on the re-homing front. The more good homes we can find for horses and ponies on our loan scheme the more we can take in that need our help. 2008 was also a successful year for fundraising for the centre. The annual summer open day in July drew 1,500 visitors and raised over £3000 while the Christmas fun day in December raised almost £2000. Generous grants from the East Staffordshire Borough Council and the International Tree Foundation are enabling Blue Cross to plant 1,000 native trees to create two separate areas of woodland, one between the paddocks and one along the back boundary of the centre. 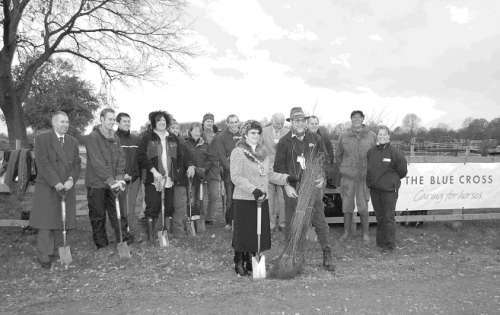 The trees will help to regenerate some of the open land and encourage wildlife but will also be used as memorial woodlands, where bereaved owners will be able to purchase a tree in loving memory of their horse or pet. As the trees grow they will also provide important shelter for the horses at the centre. Earlier this year, The Blue Cross offered its support to the Coors Visitor Centre in Burton by providing temporary boarding facilities for its three popular Shire horses, when the Coors Visitor Centre and Museum of Brewing closed. As a mark of appreciation, twenty members of staff from the Coors Brewery have volunteered their services to help plant trees at the centre. Over 2,000 people supported the event, raising over £3,200 for the homeless horses and ponies who are living at the centre until they are ready to find new homes. This free annual event has become a favourite occasion on the local calendar and what’s more it’s all for a worthy cause, as proceeds from the day go towards caring for the needy horses and ponies in the charity’s care. Money raised on the day will go towards helping animals like Boris, Bertie and Benji, three badly neglected ponies that were admitted to The Blue Cross Rolleston centre via the RSPCA in the spring of 2008. The ponies were nervous and in very poor condition but with intensive handling they soon gained confidence and quickly put on weight and condition. Boris has since been rehomed as a riding pony. Bertie and Benji are taking a little more time but are progressing well and should be ready to go to a new home soon (Report - August 2009). The Blue Cross equine welfare centre at Rolleston in Staffordshire has enjoyed a successful summer season, hosting a total of eight events and raising almost £7,000, which will go towards caring for the needy horses and ponies in the charity’s care. Blue Cross ponies Misty and Star have played a starring role in helping the centre with its all its fundraising activities this year. The gorgeous little Shetlands have almost reached celebrity status as the special guests at many shows and events around the region, promoting the work of The Blue Cross. They were also one of the many attractions at the centre’s annual open day this July, which attracted over 2,000 visitors and raised £3,200. In June the centre held its first ever Barn Dance. Despite the wet weather 70 enthusiastic guests came along and helped to raise over £400. Local equestrian colleges, scouts, brownies and local societies have enjoyed guided tours of the Rolleston centre, to learn about the special design of the facilities as well as to meet some of the irresistible equine residents. Rolleston once again ran several highly popular Pony Care days during the summer holidays, including a very well-received new Mini Pony Care day for under 7s and their parents. The children all loved learning about basic horse care in hands-on fashion and some of the youngsters even mounted up for a hobby horse gymkhana! More Pony Care and Mini Pony Care days are planned for October half-term and for the Easter holidays next year. The Blue Cross Rolleston centre will be holding their Christmas fun day on 5 December. You will have the chance to enjoy a variety of demonstrations, browse the stalls, play some games and meet Father Christmas too! 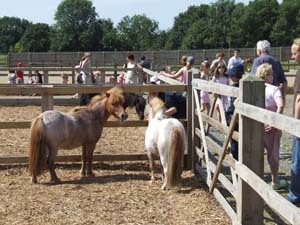 Tuesday 27 October - Mini Pony Care Day for 7 year olds and under, to be accompanied by an adult. Friday 30 - October Pony Care Day for 8-14 year olds. The Blue Cross equine centre at Rolleston-on-Dove raised a magnificent £1600 from holding a Christmas Fun Day in December. The money will go towards caring for the needy horses and ponies in the charity’s care, and is especially needed in the winter when the costs of feed and upkeep for the 52 homeless horses at the centre is significantly higher. With festive music, mince pies and mulled wine, the fun day was a great way for visitors to get into the spirit of Christmas. Members of staff and some of the resident horses and ponies at the centre entertained an admiring crowd with a jumping demonstration and some festive themed gymkhana games, while younger visitors were thrilled to meet Father Christmas! Shetlands Jenny and Percy will be indulging in a very special Christmas dinner as they sample their first mouthful of grass this Christmas. The mother and son, aged 15 and five, were recently admitted to The Blue Cross equine centre in Rolleston when their elderly owner realised he could no longer care for them. They had lived in a shed all their lives, only occasionally being turned out into a tiny yard to stretch their legs, so they had never seen grass and were relatively unhandled. Poor Percy suffered the added problem of not being able to walk properly because of a locking stifle but thankfully a routine operation has now solved this problem. In their previous home Jenny and Percy had been used to a conventional diet of hay but with the unconventional and rather less healthy addition of digestive biscuits and chopped banana skins. It’s important for any changes to a horse’s diet to be made very gradually to give the gut time to adapt so that it can digest any new feeds effectively, even if, as in this case, the new feed is grass, which is usually the most natural diet for a pony. I am writing to invite your animal loving readers to take part in a national tea party fundraiser this spring and summer in aid of The Blue Cross pet charity. The Blue Cross Tea Party combines the best of British - our love of tea and pets. To take part all you need to do is hold a tea party with friends, family or anyone you like and ask your guests to make a donation in return for tea and delicious edibles. Your party can be as lavish or as modest as you like, and if like me, you’re partial to a spot of gardening, what better way to show off those blooms than with a garden party! Every penny you raise will go towards the tireless work carried out at Blue Cross veterinary hospitals and animal adoption centres across the country. As someone who has always had a variety of pets I know what love and company they can bring, and I’m proud to be supporting an organisation that helps to keep pets and people together. So go on, pop the kettle on, have a brew and help a wonderful charity save the lives of many animals in need. To register for a free event pack and to find out more, please phone 08444 993 663. The Blue Cross open day on 24 July was a huge success with over a thousand visitors. A good time was had by all and the event raised a staggering £3,500 in aid of the horses, ponies and donkeys at the centre. The charity is grateful to the generous animal lovers who came along on the day, The Blue Cross does not receive any government funding so relies on donations and visitors to events to continue its vital work. Staff at the centre were particularly pleased to welcome back Bertie, Boris and Benji, three ponies who came to the centre in an awful state nearly two years ago. They were brought to The Blue Cross by the RSPCA after they were discovered suffering from severe malnutrition and infected with lice and worms. They were also incredibly nervous, but with intensive handling they gained confidence, put on weight and have since all found happy new homes. They are progressing well with young riders and the reunion was one of the top attractions on the day. The three ponies were part of a display of rehomed horses, nine horses in total returned to the centre for the event. Other activities included riding demonstrations, gymkhana games, Shetland pony race, stalls, and much more. It has been a busy year so far at The Blue Cross equine centre in Rolleston. The open day in July was happily a huge success and we welcomed over a thousand visitors. A good time was had by all and the event raised an incredible £3,500. We are so grateful to the generous animal lovers who came along to support us on the day, The Blue Cross does not receive any government funding so we rely on these donations and our events to continue our vital work. We were particularly please to welcome back Bertie, Boris and Benji, the three ponies who came to the centre in an awful state nearly two years ago. They were brought to The Blue Cross by the RSPCA after they were discovered suffering from severe malnutrition and infected with lice and worms. They were also incredibly nervous but with intensive handling they gained confidence, put on weight and have since all found happy new homes. They are progressing well with young riders and the reunion was one of the top attractions on the day. The three ponies were part of a display of rehomed horses, nine horses in total returned to the centre for the event. Other activities included riding demonstrations, gymkhana games, Shetland pony race, stalls, and much more. The next events are two Pony care days for youngsters during the October half-term. 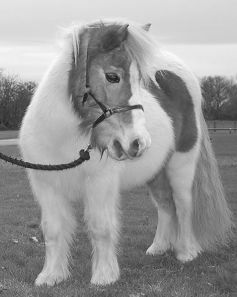 On Monday 25th October the Mini pony care day for 7 year-olds and under. This drop-in event will run between 12.00pm until 4.00pm and there will be a variety of fun and educational activities and the chance to meet and spend some time with the ponies at the centre. All children must be accompanied by an adult and the cost is £3 per child, under 3-year olds are free. On Friday 29 October, between 9.00am and 3.00pm, there is a Pony care day aimed at slightly older children (8 to 14 year-olds) who are equine enthusiasts looking to learn or improve their pony care skills and find out what is involved with looking after a pony. We ask for £20 donation per child and booking is essential. The horses and ponies at the centre will be available to meet, plus Timbo the donkey and his new friend Peter. Donkeys are particularly social animals and often bond for life. Sadly for Peter his two previous friends died but The Blue Cross carefully introduced him to Timbo to see if they would get along. Happily, they quickly became fast friends and are now an affectionate and inseparable duo. There will also be a special Christmas fun day at the centre on Saturday 4 December. For more information contact The Blue Cross on 0845 260 5505 or email rolleston@bluecross.org.uk. You can also visit us at the Rolleston equine centre on Dovecliff Road, Rolleston, DE13 9AU. Opening hours are: Monday/Tuesday/Friday by appointment only, Saturday, Sunday or Thursday from 12.00-4.00pm and Wednesday from 12.00-7.00pm. Why not join our Facebook group. The centre is bursting at the seams and bustling with activity at the moment, largely because of a big increase in the number of horses and ponies needing our help but also because winter, with its short days and chilly weather, means extra work to keep our horses and ponies warm, healthy and well-fed! Our Christmas fun day was almost called off because of the weather forecast but in the end over 10cm of snow didn’t deter our intrepid supporters who turned out in their masses to support us. We are very grateful to you all! Our herd of Shetland ponies proved to be an irresistible draw for our visitors and many of the children enjoyed having a go at grooming them. Most of these ponies have now found new homes but little skewbald mare Jenny, pictured, is sadly still here, which surprises us because as you can see from the picture she’s gorgeous! Jenny came to the centre with her son Percy back in 2009, when their elderly owner couldn’t care for them anymore. They had lived in a shed for most of their lives and as well as a normal diet of hay they had been fed on digestive biscuits and chopped banana skins, which is not the most conventional diet for a pony! This year we will be celebrating out fifth anniversary. We are planning a big party during September and would love to see you there. You can keep up-to-date with our exciting schedule of events, including Pony Care days for youngsters during the school holidays, our annual tea party on Monday 18th April April and our popular summer open day on Saturday 23rd July, by joining us on Facebook. Alternatively for more information, please contact The Blue Cross on 0845 260 5505 or visit us at the Rolleston equine centre (Hilda Archer sanctuary) on Dovecliff Road, Rolleston, DE13 9AU. Opening hours are: Monday/Tuesday/Friday by appointment only; Saturday/Sunday/Thursday from 12-4pm; and Wednesday from 12-7pm. It has been a very busy start to 2011 with 27 horses coming to the centre needing our care and 21 going off to new homes. Three of the new admissions were ponies called Sambuca, Tequila and Brandy. They were brought to us by the RSPCA and after veterinary examinations we discovered the exciting news that Sambuca is expecting! This will be the first new foal at the centre in our five year history. Sambuca isn’t the only one with baby news as Nicci, one of our horse care and riding grooms, is also expecting her first child in September! Our annual tea party in April was a great success with lots of visitors coming to support us and we raised over £500. There was a race against time for the children to find as many Easter eggs as possible and families enjoyed making the most of the gorgeous weather and their 'Mad Hatters' picnics on the lawn. As well as demonstrations with the horses there was the chance for the children to decorate an egg or Easter bonnet and a Mad Hatters Easter bonnet parade took place at the end of the afternoon. This year we have reached the milestone of helping horses and ponies at Rolleston for five years. We will be celebrating this special anniversary at our summer open day on 23rd July between 10am until 3pm. As well as cutting a special 5th birthday cake activities on the day will include riding demonstrations, a bouncy castle and face painting for children, craft and refreshment stalls, a mini farmers market and tombola. There will also be the chance to meet all the horses and ponies currently staying at the centre. This annual free event has become an occasion not to be missed on the local calendar and has proved to be a memorable day amongst the public, what’s more all the proceeds go to the worthy cause of caring for needy horses and ponies in the charity’s care. For more information, please contact The Blue Cross on 0845 260 5505 or visit us at the Rolleston Equine Centre (Hilda Archer Sanctuary) on Dovecliff Road, Rolleston, DE13 9AU. Opening hours are: Monday/Tuesday/Friday by appointment only; Saturday/Sunday/Thursday from 12-4pm; and Wednesday from 12-7pm. The fifth anniversary year for The Blue cross equine centre in Rolleston has been highly busy and exciting so far. The birthday celebrations on 23 July were a great success with well over 1000 visitors. Visitors on the day were invited to meet the newest arrival at the centre. The first ever foal to be born on the site was seen by small groups of visitors with her mum, Sambuca. Although less than a month old on the day the tiny cute foal loved all the attention. She will stay in the care of The Blue Cross until she is old enough to find a home of her own. Sambuca was one of three horses who were transferred to The Blue Cross from the RSPCA. Don’t miss the next event at the centre. On Saturday 3 December 2011 from 11.00am until 3.00pm. The Blue Cross in Rolleston will be celebrating the start of the festive season with a special fun day with special guest Father Christmas. There will also be mince pies, mulled wine, stalls and fundraising activities including a tombola and a raffle. All monies raised will help care for the homeless horses, ponies and donkeys at the centre. So far this year the centre has taken in 55 horses and ponies, another four will be arriving very soon. Happily 37 have gone to new homes so far this year. The Blue Cross has been marking the release of the latest Steven Spielberg blockbuster ‘War Horse’ by launching a special exhibition of material from its archives. Although the centre in Rolleston has been helping horses for over five years, the charity’s earlier work was involved with helping horses and other animals used in wartime. During World War One, The Blue Cross provided horse ambulances and animal hospitals on the front lines to treat sick and injured horses. A worldwide fundraising campaign also paid for special packs of veterinary treatment and comforts for soldiers to care for their horses. The archives reveal the close affection soldiers felt for their animals. Letters sent to The Blue Cross from soldiers show that they cared a great deal for their horses and thought of them more as beloved companions than just military equipment. For more information about the local centre, please contact The Blue Cross on 300 777 1520 or visit the Rolleston centre (Hilda Archer sanctuary) on Dovecliff Road, Rolleston, DE13 9AU. Opening hours are: Monday/Tuesday/Friday by appointment only; Saturday/Sunday/Thursday from 12-4pm; and Wednesday from 12-7pm. The Blue Cross re-homing centre in Rolleston has been helping horses, ponies and donkeys for over five years and during these tough economic times we are needed more and more to help sad cases of neglect and mistreatment. Boyd arrived at the centre last year with two other ponies called Spencer and Young. They were rescued from a farm where they had been living in terrible conditions. All three ponies were in a bad way but it was Boyd who needed especially urgent care. He was shockingly weak and his muscles were severely wasted. He had split hooves, his skin was crawling with lice and his stomach was full of worms. He was also a very anxious pony, especially around feeding times. He would shake his head violently and shy away when we approached, a poignant reminder of his traumatic past when he had to fight other horses for food. Although he still has a long way to go, Boyd has made amazing progress. We treated his lice and worms and then worked on rebuilding his underfed body and helping him learn to trust people for the first time. He now plays happily in the paddock with Spencer and Young and we hope it won’t be too long before he is well enough to find a new home. Help us to help more unwanted, neglected and mistreated ponies like Boyd and come along to our summer open day. This year’s event will be held at the centre on -Saturday 21 July 10.00am - 3.00pm. You will be able to meet many of the horses, ponies and donkeys currently staying with us. Come and see the Pony Club and watch riding demonstrations. There will also be a raffle, tombola and refreshments available all day. We hope to see you there, we are so grateful for the ongoing generous support from local animal lovers – it really does make a difference! For more information about the Summer event and local centre, please contact Blue Cross on 0300 777 1520 or visit the Rolleston centre (Hilda Archer sanctuary) on Dovecliff Road, Rolleston, DE13 9AU or our website www.bluecross.org.uk. Opening hours are: Monday/Tuesday/Friday by appointment only; Saturday/Sunday/Thursday from 12-4pm; and Wednesday from 12-7pm. A huge thank you to everyone who joined us for our open day back in July. We had a fantastic turnout and raised over £2,200 which will really help us care for all the homeless horses, ponies and donkeys currently staying with us at the centre. We had great fun with all our demonstrations and visitors on the day also enjoyed the stalls, bouncy castle and lots of children had their faces painted too. Please join us at our next event which is an early Christmas bash on Saturday 1 December from 11am until 3pm. This free event will be another chance to meet all the homeless animals being cared for at the centre and there will be more demonstrations, stalls, mulled wine, mince pies and other refreshments. Autumn, for some animals, can mean fear as fireworks night draws near. Some are deeply afraid of the noise and flashes and many are confused by the dramatic changes to their environment. If you are planning to host a firework event this autumn please contact all the Blue cross in Rolleston and all the stables and yards in the area to let them know and can be prepared. Please avoid setting fireworks off near any fields with horses or stables and aim fireworks in the opposite direction. Please avoid using Chinese lanterns because they are really scary for horses and the wires frames can cause injury to horses and livestock if they land in their field. • Don’t ‘comfort’ your pet by cuddling them or making a fuss, they will just think you are scared too and it may make them worse. • Keep dogs, cats, rabbits and other small pets indoors when fireworks are expected and help them find a safe place to hide. If they want to stay under the bed all night then let them, don’t try and coax them out as they are usually better in a safe hiding place where they will feel secure. • Make sure dogs are walked earlier in the day. • Make sure your pets are microchipped and/or wearing ID tags in case they do get scared and run away. For more advice about keeping pets and horses safe and calm over fireworks season visit our website at www.bluecross.org.uk or pop into the Rolleston centre (Hilda Archer sanctuary) on Dovecliff Road, Rolleston, DE13 9AU to pick up a free leaflet. The centre is open for visitors on Saturday, Sunday and Thursday between 12 and 4pm and Wednesday from 12-7pm. To contact the centre for an appointment at other times please call 0300 777 1520. Keep up to date with all the latest news at the centre on Facebook. As 2012 draws to a close we are reflecting on another busy year at Blue Cross in Rolleston. Our first foal to be born at the centre was rehomed in the summer along with another miniature Shetland pony. Tinker was born in the early hours of July 2011. Staff had stayed at the centre to monitor her mum Sambuca throughout the night. There was no fear of anyone missing the birth as resident donkeys Timbo and Peter made lots of noise to welcome Tinker to the world! Tinker grew into a happy healthy young pony who loved attention from people. She became friends with another miniature Shetland pony called Peanut. Peanut was brought to Blue Cross with her mother Bridie after they were rescued by the RSPCA. Youngsters Tinker and Peanut were weaned from their mums and given lots of positive experience of being handled by Blue Cross staff to make sure they were prepared for a future with new owners. Very happily Tinker and Peanut have remained the best of friends ever since. Earlier this year Blue Cross found them a home together. The ponies are regularly taken for walks around the village where they now live and are always stopped by local people who want to say hello. They have now become popular local ‘celebrities’ and we are very pleased that they have settled in so well and are loving their new lives. Tinker and Peanut’s mums have also since been rehomed. Happily they have also stayed together as they had also become good pals. Look out for our events throughout 2013 including half-term pony care days for children, our Spring tea party and summer open day. Every penny raised at our events really does help us care for many horses and ponies like Tinker and Peanut until we can find them new homes. 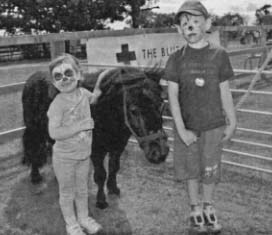 For more about the 2013 events programme and the horses, ponies and donkeys currently staying at the centre, please contact Blue Cross on 0300 777 1520 or visit the Rolleston centre (Hilda Archer sanctuary) on Dovecliff Road, Rolleston, DE13 9AU. Our opening hours are: Monday/Tuesday/Friday by appointment only; Saturday/Sunday/Thursday from 12-4pm; and Wednesday from 12-7pm. Visit www.bluecross.org.uk to find out more about the charity’s work and why not join us on Facebook? Animal lovers and aspiring bakers everywhere are being invited to put a very special date in their diary for the annual Blue Cross Tea Party on Friday 10th May 2013, to help sick and homeless pets. With tea and cake a firm favourite of the British public, taking part couldn’t be easier. Just put the kettle on, bake up your favourite recipes then invite friends and family over to ‘paws’ for a cuppa and a cake. Every penny raised will go towards the care of the animals at Blue Cross rehoming centres and animal hospitals. To order for a free Tea Party host pack, full of ideas and recipes, visit www.bluecross.org.uk/teaparty. Blue Cross in Rolleston’s own tea party on Saturday 11 May 11.00am until 3.00pm. We’ll have plenty of tea and delicious home-made cakes and there will be the chance to see our beautiful grounds and meet some of the horses, ponies and donkeys at the centre. The recent cold snap and snow flurries were beautiful and the centre looked stunning. All of the horses and ponies weren’t bothered one bit by the cold and some even seemed to enjoy it! Some needed a bit of extra warmth and Tilly our 19 year old looked absolutely stunning with the snow falling all around her. A special thank-you to everyone who came along to our Christmas fun day back in December. We enjoyed seeing so many supporters and the event was a great success. We raised a brilliant £1,400 On the day which really has helped us look after for all the animals in our care. For more advice about caring for pets and horses visit our website at www.bluecross.org.uk or pop into the Rolleston centre (Hilda Archer sanctuary) on Dovecliff Road, Rolleston, DE13 9AU to pick up a free leaflet. The centre is open for visitors on Saturday, Sunday, Wednesday and Thursday between 12 and 4pm. To contact the centre for an appointment at other times please call 0300 777 1520. A big “thank you” to everyone who came along to our Tea Party in May. All funds raised on the day really will help us look after all the horses and ponies at the centre until we find new homes for them. We are seeing more unwanted, neglected and mistreated ponies who desperately need our help and we are always extremely grateful for donations, however small. And we really enjoy showing visitors around our beautiful site. Our next event is our summer open day. This year’s event will be held at the centre on Saturday 20 July from 10.00am until 3.00pm. You will be able to meet many of the horses, ponies and donkeys currently staying with us. Come and see demonstrations and take part on the raffle and tombola. We also welcome families who would like to visit us during the summer holidays. We have benches and tables for anyone who wants to pop in for a picnic and there’s plenty of space to walk around and enjoy. Saturday/Sunday/Thursday from 12-4pm; and Wednesday from 12-7pm. To keep up with all the latest news about the centre join us on Facebook. A huge thank you to everyone who joined us for our open day back in July. We had a fantastic turnout and all the generous donations, which came to over £2,000, will really help us care for all the homeless horses and ponies currently staying with us at the centre, including our very special two new foals! Visitors on the day enjoyed seeing behind-the-scenes at the centre and also all the stalls, bouncy castle and lots of children had their faces painted too. The nights drawing in as we enter the autumn period can be very scary for some animals. Not because they are afraid of the dark, but for some it means that the bangs and flashes of fireworks are on their way. Some pets and other animals are deeply afraid and many are confused by the dramatic changes to their environment. If you are planning to host a firework event this autumn please contact Blue Cross in Rolleston and all the stables and yards in the area to let them know so that they can be prepared. Please avoid setting fireworks off near any fields with horses or stables and aim fireworks in the opposite direction. For more advice about keeping pets and horses safe and calm over fireworks season visit our website at www.bluecross.org.uk or pop into the Rolleston centre (Hilda Archer sanctuary) on Dovecliff Road, Rolleston, DE13 9AU to pick up a free leaflet. The centre is open for visitors on Saturday, Sunday and Thursday between 12 and 4pm and Wednesday from 12-7pm. To contact the centre for an appointment at other times please call 0300 777 1520. Keep up to date with all the latest news at the centre on Facebook. We have had another great and busy year at Blue Cross in Rolleston. We have taken in over 80 horses and ponies so far this year and happily a similar number have gone out on loan to new homes. Do come along to our next event on Saturday 7 December from 11am until 3pm. We'll be getting into the festive spirit our Christmas funday which promises to be a fun event for the whole family. Come and meet Santa or relax with a mince pie. There will be a variety of stalls including a tombola and raffle. There will also be the chance for youngsters to get creative in the children’s crafts area. This event is also the perfect opportunity if you’re interested or thinking about rehoming a horse. Come along to meet the team and have a chat about the horses currently at the centre needing new homes. Planning for our 2014 events calendar is still underway but will include a tea party fundraiser in the spring, our big summer fun event and Christmas event. We are also open to visit for picnics and days out for several days of the week. In 2013 we offered free microchipping for pets and we hope to do this again next year as they were a great success. Microchipping a pet is the best way to ensure it can be identified if they should become lost or stolen. A tiny chip, the size of a grain of rice, is injected under their skin and registered on a database with the owner’s contact details. If the pet is found as a stray a simple scan will reveal the microchip number and contact details so you can be quickly reunited. Owner must remember to update their contact details with the database company if the move home or telephone number changes. For more about the 2014 events programme and the horses and ponies currently staying at the centre, please contact Blue Cross on 0300 777 1520 or visit the Rolleston centre (Hilda Archer sanctuary) Dovecliff Road, Rolleston, DE13 9AU. Our opening hours are: Monday/Tuesday/Friday by appointment only, Saturday/Sunday/Wednesday/Thursday from 12-4pm, open until7pm on Wednesdays during summer months. At Blue Cross re-homing centre in Rolleston we are caring for a lot of foals and youngsters who are desperately in need of new homes. One of them is Marley who is a handsome young pony with plenty of character. Marley came to the centre last July after he was rescued, along with his mother, by the RSPCA. Marley was only about a month old at the time but has settled nicely at the centre and is progressing really well with his handling. He is a stunning foal who is getting ever more handsome as he matures and grows. Due to his young age it is important that we find him a home that will be able to continue his training correctly. A foal can be a great option for someone who has the time to spend caring for and handling a pony. They are very rewarding and it’s lovely to see them grow into a mature pony. Marley has lots of potential and will make a great all-round pony suitable for riding and all sorts of activities in the future. All our foals are looking for homes as non-ridden companions until they’re old enough to be backed and ridden, they can either return to the centre to be backed or this can be done in an experienced home. 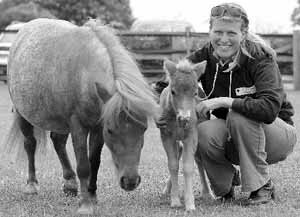 They will need someone with previous experience of caring for and training foals and can provide the foal with companionship of a similar size and age pony. Marley will be rehomed on a monitored and supported loan scheme until he is old enough to begin groundwork. Blue Cross will reimburse the annual vaccinations, dental and health checks, plus provide the first year's worming programme. If you think you can offer Marley, or any of our other foals, a loving home that meets his needs please get in touch with us! Planning for our 2014 events calendar is still underway but will include a tea party fundraiser, our big summer fun event and a Christmas event. We are also open to visit for picnics and days out for several days of the week. For more about the 2014 events programme and the horses and ponies currently staying at the centre, please contact Blue Cross on 0300 777 1520 or visit the Rolleston rehoming centre on Dovecliff Road, Rolleston, DE13 9AU. Our opening hours are: Monday/Tuesday/Friday by appointment only, Saturday/Sunday/Wednesday/Thursday from 12-4pm. Thank you to everyone who joined us to 'paws' for tea in May. It was a great success and we are still all on a diet after all those delicious slices of homemade cake! All funds raised on the day really will help us look after all the horses and ponies at the centre until we find new homes for them. We continue to take in many unwanted horses and also their foals. About half of the horses we are currently caring for are youngsters under four-years-of age who are too young to be ridden but would love to be in a proper home. We are looking for experienced owners who can help us with this – ideally we would like our young ponies to have a companion of a similar age and size to grow up with. Because there is such a high need to rehome unwanted horses, and we are sadly seeing more who have been abandoned, we also rehome horses directly from previous owners to new ones so if you are looking for a horse or pony please visit our website for the full picture of all of the horses we are trying to rehome. Please come and visit us! We are open regularly over the summer holidays so why not pop in with a picnic – we have plenty of benches and tables and would love to see you enjoy our beautiful site! Our next event is our SUMMER OPEN DAY. This year’s event will be held at the centre on Saturday 19 July from 10.00am - 3.00pm. You will be able to meet many of the horses, ponies and donkeys currently staying with us. Come and see demonstrations and take part on the raffle and tombola. For more information about the summer event and visiting the centre, please contact Blue Cross on 0300 777 1520 or visit the Rolleston centre (Hilda Archer sanctuary) on Dovecliff Road, Rolleston, DE13 9AU or our website www.bluecross.org.uk . Opening hours are: Monday/Tuesday/Friday by appointment only; Saturday/Sunday/Thursday from 12-4pm; and Wednesday from 12-7pm. Despite it raining 'cats and dogs' on our open day (the only wet day in possibly weeks!) We had a great turnout and very generous donations, which will really help us care for all the homeless horses and ponies currently staying with us at the centre. We are currently looking after three foals, and their mums, who need extra special care so we are grateful to everyone who braved the rain to join us! The autumn evenings will soon be drawing in and this can mean some animals become fearful of noisy nights ahead. Fun for us but not for many pets and horses, Firework night can be very scary for some and it is important to make sure they are safe when Diwali, Bonfire Night, Christmas and New Year celebrations come around. Blue Cross asks local residents to let the centre know if they are planning an event with fireworks and to not set off any fireworks near fields with horses or stables and to aim fireworks in the opposite direction. Blue Cross also asks that Chinese lanterns are avoided because the wires frames can cause injury to horses and livestock if they land in a field. • Don’t ‘comfort’ your pet by cuddling them or making a fuss, they will just think that you are scared too and it may make them worse. For more advice about keeping pets and horses safe and calm over fireworks season visit our website at – www.bluecross.org.uk/fireworks or pop into the Rolleston centre (Hilda Archer sanctuary) on Dovecliff Road, Rolleston, DE13 9AU to pick up a free leaflet. The centre is open for visitors on Saturday, Sunday, Wednesday and Thursday between 12 and 4pm and until 7pm on Wednesdays during summer months. To contact the centre for an appointment at other times please call 0300 777 1520. Keep up to date with all the latest news at the centre on Facebook. Blue Cross in Rolleston has seen another busy year. As the horse welfare crisis continues we have taken in many horses in need. We admitted a lot of cob ponies early in the year after they had been found fly-grazing. At Rolleston we admitted up to 30 cobs in just the first few months of the year, nationally Blue Cross admitted 60 in total! Happily though, we have seen many go off to new homes where we know they will be loved after their sorry start to life. The weather has played a major part at the centre this year. Earlier in the year gales and storms destroyed a horse shelter and brought down essential fencing between paddocks. Thankfully all the horses were safely in the main stables and not at risk from the flying debris. We were very grateful for the kind donations to repair all the damage. Sadly, more strong winds have brought another shelter down recently which is beyond repair and will have to be replaced. Despite lovely weather for most of the summer, on our open day in July it rained ‘cats and dogs’! We were delighted to still see a good turnout during the downpour and saw around 300 visitors and raised a fantastic £1,500 on the day. Our next event will be on Saturday 6th December from 11am to 3pm. We’ll be getting into the festive spirit with our Christmas funday which promises to be a fun event for the whole family. Come and meet Santa or relax with a mince pie. There will be a variety of stalls including a tombola and raffle. 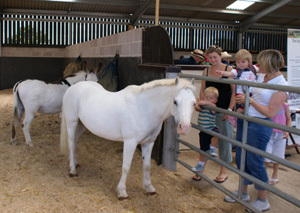 It is also a great chance to meet the horses and ponies at centre. For more information about the Christmas events and the horses and ponies currently staying at the centre, please contact Blue Cross on 0300 777 1520 or visit the Rolleston centre (Hilda Archer sanctuary) on Dovecliff Road, Rolleston, DE13 9AU. Our opening hours are: Monday/Tuesday/Friday by appointment only, Saturday/Sunday/Wednesday/Thursday from 12-4pm. Visit www.bluecross.org.uk to find out more about the charity’s work and why not join us on Facebook for all the latest news? Leading pet charity Blue Cross has revealed the hidden role its thousands of shop, admin and educational volunteers have played giving injured and abandoned pets a second chance. As it celebrates their priceless support, Blue Cross in Rolleston-on-Dove is calling on others to give an increasingly valuable donation - time. Recent research by the charity showed that over 50 per cent of people surveyed thought the best way to help a pet charity was to directly care for sick and abandoned pets. Only four per cent highlighted the benefits of behind the scenes admin support and two per cent working in a charity shop. With increasing demands on its services, Blue Cross wants to double the number of pets it cares for by 2021. The Blue Cross centre, on Dovecliff Road, is currently recruiting for volunteers to help with gardening, site maintenance, administrative duties and animal care. For those unable to get to the centre, almost 14 per cent of the charity’s volunteers work remotely providing education talks at schools, carrying out vital research from home, offering short term care for pets in their own home or supporting pet owners over the Pet Bereavement Support line. The charity claims that an hour volunteering in one of its charity shops can raise the funds needed to give lifesaving vaccinations to a litter of eight abandoned puppies. The nearest Blue Cross charity shops can be found in Stafford and Cannock. A huge thank you to everyone who joined us for our open day back in July. We had a fantastic turnout and all the generous donations, which came to over £2,000, will really help us care for all the homeless horses and ponies currently staying with us at the centre. Blue Cross also asks that Chinese lanterns are avoided because the wire frames can cause injury to horses and livestock if they land in a field. For more advice about keeping pets and horses safe and calm over fireworks season visit our website at www.bluecross.org.uk/fireworks or pop into the Rolleston centre (Hilda Archer sanctuary) on Dovecliff Road, Rolleston, DE13 9AU to pick up a free leaflet. The centre is open for visitors on Saturday, Sunday, Wednesday and Thursday between 12 and 4pm and until 7pm on Wednesdays during summer months. To contact the centre for an appointment at other times please call 0300 7771520. Keep up to date with all the latest news at the centre on Facebook. Our next event will be on Saturday 5 December from 11am to 3pm. We’ll be getting into the festive spirit with our Christmas Funday which promises to be a fun event for the whole family. Come and meet Santa or relax with a mince pie. There will be a variety of stalls with Blue Cross Christmas cards and 2016 calendars plus a tombola and raffle. There will also be the chance to meet some of the homeless horses and ponies staying at the centre and the perfect opportunity if you’re thinking about taking on a horse. Come along to meet the team and have a chat about the horses needing new homes and for general advice on horse care. Visit www.bluecross.org.uk to find out more about the charity’s work and why not follow us on Twitter or like us on Facebook for all the latest news? A seven-year-old pony with a traumatic past has finally found happiness after intensive rehabiliation and years of care at Blue Cross rehoming centre in Rolleston. 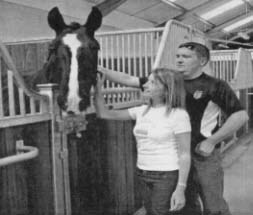 Boyd was one of a number of horses rescued from a farm in South Wales in April 2011. The group had been living in squalor in a cement yard without proper food, shelter or veterinary care. The ponies were severely underweight but Blue Cross found Boyd’s condition the most shocking, his muscles were wasted and his coat was also heavily infested with lice. He had very little experience of people so he was very nervous and frightened when he arrived. Boyd spent time in foster care to get him used to a normal life in a livery yard with other horses. While in foster care the search began to find him an extra special home with an owner who understood his delicate temperament and could give him lots of time and attention. When Jane from an Oxfordshire farm approached Blue Cross about Boyd they couldn’t believe their luck. She has a nine-acre paddock for Boyd and another rescue horse, Boris, who has become Boyd’s best buddy. You can help homeless pets by coming along to an event at the centre. Our next event is our ANNUAL TEA PARTY Saturday 14 May 11.00am - 3.00pm. For more about the charity’s work and the horses and ponies currently staying at the centre visit www.bluecross.org.uk/rolleston, join us on Facebook or contact 0300 777 1520. You can also visit the centre on Dovecliff Road, Rolleston, DE13 9AU. Our opening hours are Wednesday, Thursday, Saturday and Sunday from 12.00 – 4.00pm. Thank you to everyone who is joining us for our tea ‘pawty’ on May 14, we hope everyone will enjoy meeting some of the horses we have staying with us. All funds raised on the day really will help us look after all the horses and ponies until we find new homes for them. Saturday 2 July, 10.00am until 3.00pm. Our next event is our summer open day where we will be pulling out all the stops in celebration of our 10th year in Rolleston. We will have fun dog shows, horse demonstrations, lots of stalls and delicious refreshments. Do come and join us. Over the summer we welcome guests who would like to enjoy our beautiful surroundings. Why not bring along a picnic lunch, we have plenty of benches and tables! We are open on Thursdays, Saturdays and Sundays between 12pm and 4pm and on Wednesdays from 12pm until 7pm. At Blue Cross we are sadly seeing more who have been abandoned and are in dire need of our help. Many have not been handled and are in poor condition, with issues such as lice and worms needing urgent attention and care.. It is a joy when we find out how well they are getting on in their new homes and makes all the hard work worthwhile. For more information about the summer event and visiting the centre, please contact Blue Cross on 0300 777 1520 or visit the Rolleston centre (Hilda Archer sanctuary) on Dovecliff Road, Rolleston, DE13 9AU or our website www.bluecross.org.uk. To keep up with all the latest news about the centre join us on Facebook and Twitter. A huge thank you to everyone who joined us for our open day back in July. We had a fantastic turnout and all the generous donations, which came to over £1,500, will really help us care for all the homeless horses and ponies currently staying with us at the centre. We were delighted to be joined by VIP judges Andy Potter from BBC Radio Derby, Helen Kreft from the Burton Mail and Gary Gallagher from the Pets at Home store in Ashby de la Zouch. With the clocks going back and evenings drawing it is important to make sure our pets are able to cope with trick or treaters at Halloween and the flashes and bangs of fireworks over Guy Fawkes, Christmas and New Year’s Eve. Fun activities for us but many pets and horses can be very afraid so it is important to make sure they are safe. • Keep dogs, cats, rabbits and other small pets indoors when fireworks are expected and help them find a safe place to hide. If they want to stay under the bed all night then let them, don’t try and coax them out as they are usually best in a place where they feel safe. For more advice about keeping pets and horses safe and calm over fireworks season visit our website at www.bluecross.org.uk/fireworks or pop into the Rolleston centre (Hilda Archer sanctuary) on Dovecliff Road, Rolleston, DE13 9AU to pick up a free leaflet. To contact the centre for an appointment at other times please call 0300 777 1520. Keep up to date with all the latest Blue Cross Rolleston news on Facebook. Please join us for our Christmas Funday on Saturday 3 December from 11am to 3pm. We’ll be getting into the festive spirit which promises to be a fun event for the whole family. There will be a variety of stalls with Blue Cross Christmas cards and 2016 calendars plus a tombola, raffle and tasty mince pie treats. Two female horses and their young foals are being nursed back to health at Blue Cross rehoming centre in Rolleston, after being abandoned with little access to food or water. Found amongst a larger group of horses who were all in a bad way, the four now at Blue Cross were in the worst condition with protruding ribs and hip bones. One of the foals was found cowering behind his mum and found to be suffering from photosynthesis, which means he is sensitive to sunlight. Seven-year-old ‘Little Miss Agatha’ and her foal Rio and four-year-old Marple and her foal Poirot were found in a field in the Midlands. The fencing was falling down and in the past the horses had been seen wandering into the nearby dangerous busy road. Rio was very weak and when the team realised he wasn’t feeding from his mum the team tried to encourage him to drink replacement milk and put them both on a feeding plan to help them gain weight and improve their overall condition. Both foals are doing well and are being weaned off their mums and will be looking for new homes in the New Year. Their mums are also now healthy and being assessed as potential riding ponies and will also look for loving new homes soon. The foals are looking for a short-term home until they are four years old when Blue Cross will need to re-assess their future as potential riding ponies. They will need a companion of a similar age in their new home and need to be cared for by someone who has experience of caring for and handling young ponies. Rio is vulnerable to sunburn so will need special care and monitoring when he is outside in the summer months to prevent skin sores due to his condition. To find out about horses and cats looking for new homes through Blue Cross in Rolleston, or to make a donation towards their care, visit www.bluecross.org.uk or contact the centre on 0300 777 1520 or rolleston@bluecross.org.uk. Thank you to everyone who came along to our Spring tea party, our next event is our Summer open day on Saturday 8 July from 10am to 3pm. We are offering spaces for anyone who would like a stall on the day so do get in touch if interested. We are so grateful to all our supporters, every penny raised at these events really does help us care for all the horses, ponies and cats we care for. Blue Cross in Rolleston has been rehoming horses, ponies and donkeys for over ten years and over the past few months we have also been helping cats find a new home when their owner can no longer keep them. Cats are rehomed to their new homes directly from their previous owner. We are also now rehoming cats from a special new cattery at the centre. Thanks to a team of dedicated volunteers, we look after cats who need a place to stay while we find them a home. All cats looking for a home through Blue Cross in Rolleston can be found on the Blue Cross website. Over the summer we welcome guests who would like to enjoy our beautiful surroundings. Why not bring along a picnic lunch to eat at one of our benches and tables! We are open on Thursdays, Saturdays and Sundays between 12pm and 4pm and on Wednesdays from 12pm until 7pm. Thanks to local animal lovers who came along to our open day in July. We had a great turn out and lots of fun was to be had. At time of going to press we are still totting up the amount raised but thanks to everyone who donated and continues to support us, we really could not do the work we do without you. With the evenings drawing in pet owners need to take extra care of their pets over the coming weeks. Halloween can mean more visitors who may look very strange to pets if dressed up in seasonal scary costumes. Guy Fawkes night also needs to be prepared for so that pets have safe and secure places to hide if the flashes and bangs bother them. Keep dogs, cats, rabbits and other small pets indoors when fireworks are expected and help them find a safe place to hide. If they want to stay under the bed all night then let them, don’t try and coax them out as they are usually best in a place where they feel safe. Make sure dogs are walked earlier in the day. Make sure your pets are microchipped and/or wearing ID tags in case they do get scared and run away. For more advice about keeping pets and horses safe and calm over fireworks season visit our website at www.bluecross.org.uk/fireworks or pop into the Rolleston centre (Hilda Archer sanctuary) on Dovecliff Road, Rolleston, DE13 9AU to pick up a free leaflet. The centre is open for visitors on Saturday, Sunday, Wednesday and Thursday between 12 and 4pm. To contact the centre for an appointment at other times please call 0300 777 1520. Keep up to date with all the latest Blue Cross Rolleston news on Facebook. Season’s greetings to local animal lovers and Blue Cross supporters. We have had a fantastic year so far and are delighted to have already rehomed a number of cats through our new cattery based at our lovely centre in Rolleston. A huge thank you to the volunteers who run this service and all of our volunteers at the centre, we couldn’t do what we do without your help! Please come and join us for our Christmas Funday on Saturday 2 December from 11am to 3pm. We will be getting into the festive spirit with a variety of stalls selling Blue Cross Christmas cards and 2018 calendars plus a tombola, raffle and tasty mince pie treats. There will also be the chance to meet some of the homeless horses and cats currently at the centre. Come along to meet the team and have a chat about the animals needing new homes and for general advice on horse and pet care. For more information about the Christmas event and the cats and horses currently staying at the centre, please contact Blue Cross on 0300 777 1520 or visit the Rolleston centre (Hilda Archer sanctuary) on Dovecliff Road, Rolleston, DE13 9AU. Our opening hours are: Monday/Tuesday/Friday by appointment only, Saturday/Sunday/Wednesday/Thursday from 12-4pm. We are looking forward to a busy year ahead and helping even more pets than ever before. We were delighted to open our new cattery unit in 2017, which is run by a fantastic team of volunteers who have since found loving new homes for over 18 cats and kittens. 12-year-old cat Oscar is looking for a new home (at time of going to print). He is a chatterbox who loves the sound of his own voice. He can be a little nervous of people so will need patient owners who can give them all the time he needs to get used to his new environment. He loves the great outdoors so is looking for a rural home. He prefers his own space but is a good listener who will happily curl up in a chair and hear all about your day. For anyone who cannot take on a pet there is an option to sponsor instead for just £3 per month. Daffodil is a female, nine-year-old native breed horse looking for a home as a non-ridden companion to another horse. She hasn’t had the best start in life but she has gained lots of confidence since she has been cared for by the Rolleston team. She is also available to sponsor as a gift. All sponsors receive a welcome pack, regular emails about how their sponsored pet is doing and downloadable factsheets and certificates. You can also help homeless pets by coming along to the centre’s annual tea party on Saturday 12 May, check our Facebook nearer the time for more details. You can also lend a hand as a volunteer, looking after the cats or other roles such as fundraising and helping out at fun events. For more about the charity’s work and the horses, ponies and cats currently staying at the centre or to make a donation towards their care visit www.bluecross.org.uk/rolleston, join us on Facebook or contact 0300 777 1520. You can also visit the centre on Dovecliff Road, Rolleston, DE13 9AU. Visit bluecross.org.uk/rolleston or our facebook page for details of our opening hours and directions to the centre. Blue Cross in Rolleston has been rehoming horses, ponies and donkeys for over ten years and we now also help cats and kittens find a new home when their owner can no longer keep them or if they are found as a stray. We have a fantastic team of volunteers who run the cattery and care for the cats looking for a new home. All cats, kittens, horses and ponies looking for a home through Blue Cross in Rolleston can be found on the Blue Cross website – bluecross.org.uk. Over the summer we welcome guests who would like to enjoy our beautiful surroundings. Why not bring along lunch to eat at one of our picnic benches? We are open every weekend 11.00am until 4.00pm and on Mondays, Tuesdays, Thursday and Fridays by appointment. For more information about our events and visiting the centre, please contact us on 0300 777 1520 or visit the Rolleston centre (Hilda Archer sanctuary) on Dovecliff Road, Rolleston, DE13 9AU. Anyone who feels they can provide an experienced, long term home for a horse or pony in the charity’s care or would like further information on Blue Cross activities can contact the Rolleston Equine Centre on 0845 260 5505, e-mail rolleston@bluecross.org.uk or visit www.bluecross.org.uk. Events subject to change/cancellation.